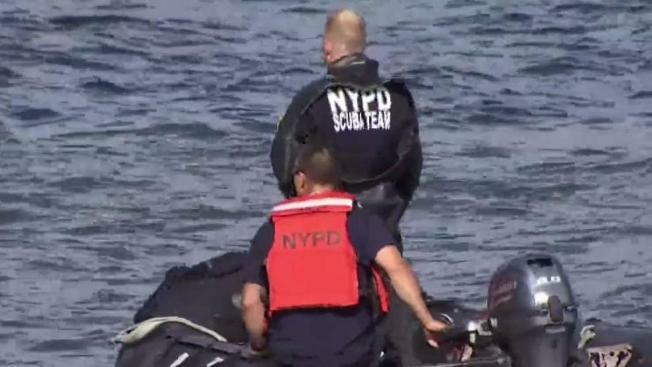 A baby was found floating in the East River on Sunday afternoon, and a tourist who saw the child jumped into the water and brought the boy ashore, witnesses said. The baby didn't survive, the NYPD said. He appeared to be about 8 months old and was wearing only a diaper. The baby was discovered near the Manhattan side of the Brooklyn Bridge just after 4 p.m., said Diana Campbell, who was visiting from Stillwater, Oklahoma. She said her husband, Monte, is a good swimmer so he jumped into the water and brought the baby to land. "She just called me over and said there was a baby in the water. I called 911. At that point I thought it was a doll," Monte Campbell said. He then performed CPR until help arrived, she said. Police said they moved the child from the embankment to the pedestrian walkway and continued CPR until an ambulance arrived. "They were giving CPR," Diana Campbell said. "My husband didn't feel a pulse or anything." A backpack was floating near the baby, she said. It was also recovered. No parent or guardian was present, police said. There were no signs of trauma and the medical examiner will determine the cause of death. It wasn't clear how long the baby had been in the water. The investigation is ongoing.